Escape to paradise with a beautiful beachfront tropical resort set on 6 acres with lush landscaped gardens, swaying palm trees, all sitting on the beachfront. Enjoy the three-story plantation style resort to soak up the sunshine on the beach or the beach side outdoor pool and hot tub while you sip on your favorite tropical drink from the poolside bar, or take advantage of the ocean side grills for an evening barbecue. Located on a sandy beach with breathtaking views of the blue Pacific Ocean and year-round cool trade winds. Accommodations include spacious air conditioned rooms with a private lanai with ocean or exotic tropical garden views. Walk to the popular Coconut Marketplace with dozens of boutique shops and restaurants. Located on the East-side just 7 miles north of the airport that is convenient for trips north, south, and west on the island. Renting from a privately managed unit gives you all the advantages for less the cost. Kauais best kept secret! This boutique establishment offer just 24 units with compact condo units, right on the ocean. This quaint Hawaiiana oceanfront complex is on Kauais east side. Each unit is individually decorated by its owner, and they are very comfortable, with everything you need for your vacation. There is no air-conditioning in the units, as the tropical breeze with windows on 3 sides of each unit, keeps the units cool. Once an Shinto Temple, now a majestic place to stay for your vacation. 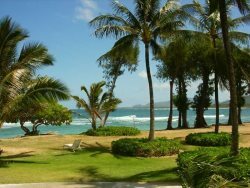 Paradise awaits you at this breathtaking oceanfront oasis that is on a 3 mile stretch of glistening sandy beach on the eastern shore of Kauai. Explore the sandy beach, soak up some rays and play in the waves of the turquoise Pacific blue ocean. You will be surrounded by exotic lagoons, cascading waterfalls and lush tropical vistas, while knowing you have made it to paradise. Enjoy this perfect destination that is nestled on 25 lush tropical acres on the breathtaking eastern coast of Kauai. The resort is close to the airport, shopping, championship golf courses and all of Kauais incredible attractions, activities and adventures. This retreat offers luxurious accommodations with private balconies.